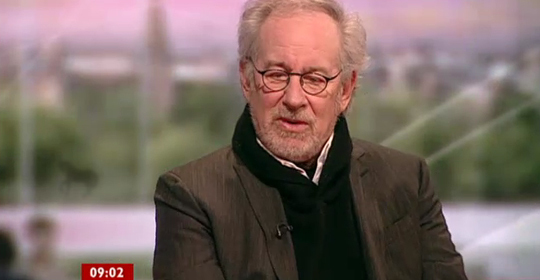 You may have caught Steven Spielberg on BBC Breakfast this morning, giving one of the few sanctioned interviews during his brief press trip to the UK. The interview was surprisingly in-depth by the show’s admittedly low standards, giving Steven ample time to answer questions on War Horse, the upcoming fourth Jurassic Park movie and a host of other subjects. Needless to say, he was his usual charming self. Talking about production on War Horse — which tells the story of a thoroughbred named Joey and his journeys through the battlefields of the First World War — Spielberg repeatedly referred to the film’s equine star by his character name. 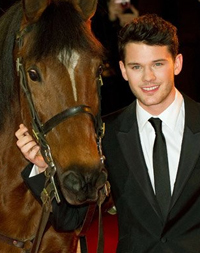 “The horse Joey had never been on screen before,” he said, adding that Joey “loved Jeremy Irvine. Whenever Jeremy was on set he would come trotting over to him”. You’d be forgiven for assuming not only that the production used a single horse for the character, but that the horse happened to have the same name as his fictional counterpart. The question of exactly how many horses played Joey in the film was one that puzzled me when I first saw War Horse at the end of last year. Despite the obvious debt owed to them, the film’s end credits make no mention of any horses by name. It seemed like a strange oversight, especially when other recent films had made such marketing capital of their animal stars. Why would Spielberg actively shy away from lauding the horses that brought War Horse to life? After a spat with Disney last month (partly involving this very issue), I pledged not to review their films going forward, but I’ll make a brief exception to say that War Horse is a pretty good movie. Sentimental for sure, but admirable and effective. And yes, a certain amount of that effectiveness relies on the audience’s ability to relate to Joey, who serves as our window into the war and its myriad horrors. But to make believe that one ‘miraculous horse’ somehow performed his entire role (as Disney are eager for audiences to believe) is ludicrous. After all, there were 10 Seabiscuits, 3 Secretariats and 4 Black Stallions, and those films required relatively little of their equine leads. There were in fact 14 ‘Joeys’, and while — much to Disney’s delight I’m sure — one did happen to have that name, the primary horse used was in fact Finder, an 11-year-old thoroughbred from California. He also portrayed Seabiscuit and (wait for it) HIS OWN MOTHER in War Horse. Even then, it would be misleading to suggest that any one horse did the bulk of the work. Bringing Joey to the screen was inevitably a collaborative effort. One horse was used mainly for close-ups, another for galloping through the trenches, and so on and so on. … walked the red carpet along with Spielberg, Irvine and the Duke and Duchess of Cambridge. The actual horse present was named Sultan, though he could just as easily have been any one of his co-stars (Civilon, Diego, Lincoln and Sueño, amongst others) as he was of course wearing makeup to closer resemble the horse described in Michael Morpurgo’s 1982 novel. Broadly speaking, I do understand why Disney aren’t shouting from the rooftops about the intricacies of creating Joey. His character is one of the film’s major selling points and it’s understandable that they don’t want to threaten the mystique by, say, outing him as his own mother. But refusing outright to acknowledge a truth as self-evident as multiple animal performers is just baffling. Does Dwayne ‘The Rock’ Johnson steadfastly avoid all questions about the authenticity of the Tooth Fairy? Did Tim Allen attend the premiere of The Santa Clause in full costume and respond only to ‘Saint Nick’? In both cases, I sorely hope so but suspect not. War Horse arrives in UK cinemas this Friday and is rated 12A. If you’re old enough to see it, you’re old enough to know fact from fiction.